The Loch Avon basin is a fine place to ski, offering easy uncomplicated descents down relatively wide gullies. It's a popular area for skiing, due to the proximity of the ski area at Cairngorm which makes access easier. As a result, you can easily combine several descents in a day. (e.g. from the car park over to the top of Stag Rocks, down Y or Diagonal Gully, then up onto Carn Etchachan and down either Castlegates or Pinnacle Gully, then up Coire Domhain and down Alladins Couloir in Coire an t-Sneachda). 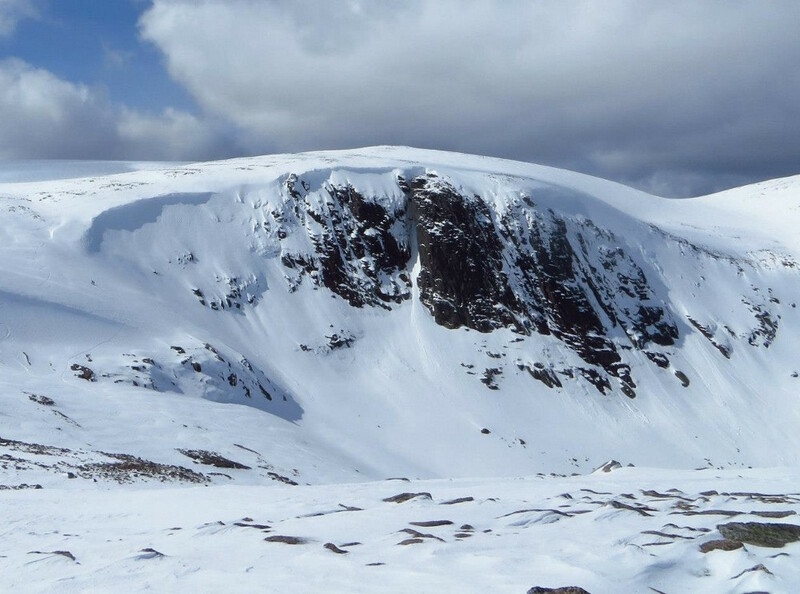 Hells Lum, the gully that gives the cliff the same name, has been skied and is a different proposition to the other gullies described, being steep and narrow. 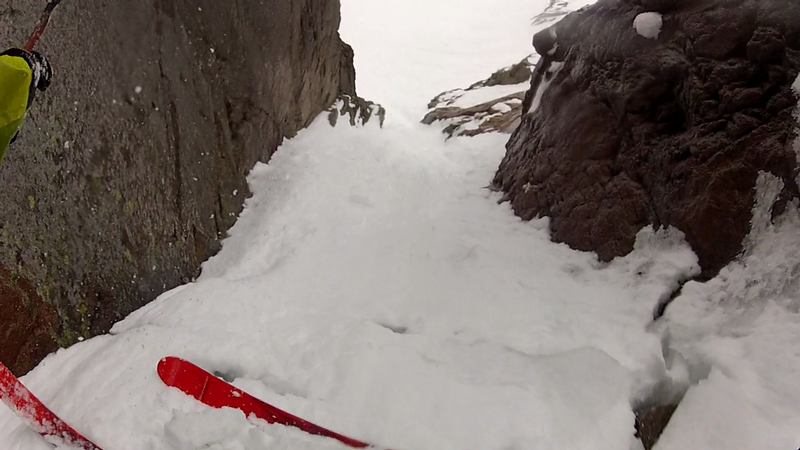 The Cairngorm Ski car park is the most logical starting point to access these lines, and has the advantage that you can sneak a descent in Coire an t-Sneachda on the way back. The easiest route back out is up Coire Domhain and onto Stob Coire an t-Sneachda. There is one relevant Scottish Avalanche Information Service forecast for Loch Avon Basin. The wide corridor that descends (diagonally!) to Loch Avon from the top of Stag rocks, and is almost a mirror image of it's neighbour Y Gully. 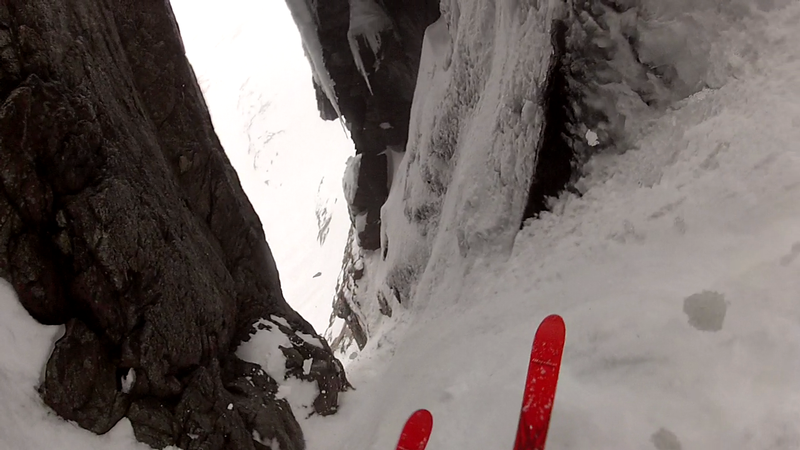 It is steepest at the top, but entry to the gully is often possible on skiers right. Once out of the gully, the snow filled debris runnel often offers a run almost down to the loch itself. A companion to Diagonal Gully on Stag Rocks. It is less defined, and a good bit wider, but worth doing. It is split at the top by a rocky island - hence the name. The skiers right option gives the most straightforward entry. The upper half is fairly mellow, but it steepens a little towards the exit of the gully. The imposing gully of Hell's Lum splits the cliff of the same name. With an overhanging rock wall on the skiers left, and the icefall of "The Chancer" on skiers right, it is an intimidating, steep line. The gully can contain a substantial ice pitch, and realistically, should only be attempted when it is banked out. In these conditions, the cornice is likely to be problematical, but should be easiest on skiers left. 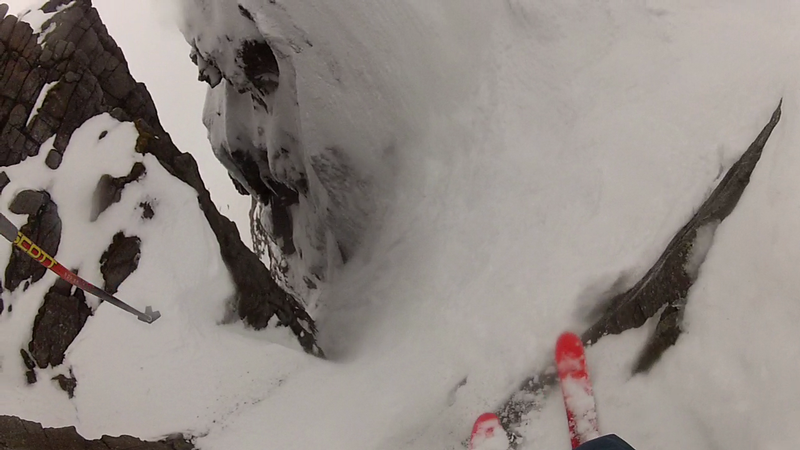 You may be faced with a short drop just below the cornice as well, depending upon build up. Where the gully narrows approximately mid way down, there is likely to be some easy angled ice, even if the main ice pitch is buried. The southerly aspect of the cliff means that "The Chancer" can be badly affected by the sun, and falling ice can be a problem. There have been descents involving abseils, but it has also been skied without. Notes: Only worth attempting when completely banked up. The wide gully that bounds the northern edge of the mighty Sticil Face. The name is derived from the impressive Forefinger Pinnacle which is situated at the top of the gully. 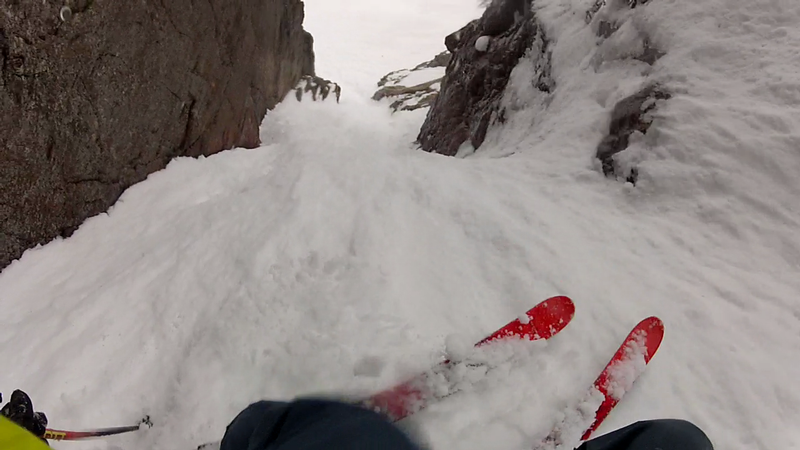 This is one of the widest gullies you are likely to ski! Notes: Easy for Grade I, and very wide. Sandwiched between the cliffs of Carn Etchachan and the Sticil Face, this well defined gully offers a fine descent. In lean/late season conditions, the boulders at the top can be bare and necessitate a short down climb to the snow on skiers left. Once past the initial narrow 10m, the angle relents a little until the gully opens out, where the angle increases a little. The exit is through a narrowing in the gully to the bouldery scarp slope below. When the snow is not plentiful, the best options from here are either hard left under the Sticil Face, or staying right below Carn Etchachan.